Are you looking for an unusual gift idea to buy for someone special? 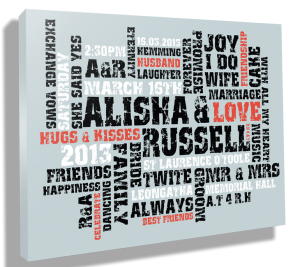 Cant find a nice gift for an occasion such as a wedding, anniversary or birthday? Then don’t worry, you have struck gold! 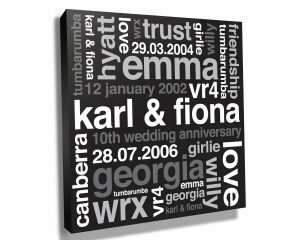 We have the perfect solution for you, Beyond a Word are the first port of call in Australia, the UK and USA for unique, highly personalised canvas word art prints. Here are a few examples of some designs we have created recently for our customers, you can also find a whole lot more in our blog or by browsing through our gallery pages, the gallery shows just a few of the great custom word art designs we have created. Its getting harder and harder to find unique gifts that people will genuinely cherish, how many times have you gone to a wedding and witnessed (or even been the giver!) of gifts being given that just won’t be remembered let alone wanted. Designing a personalised word art piece is so easy you are going to be left thinking “was that all I needed to do?”, then in just 2 days, we’ll email you a proof of your artwork for you to review and request any changes if required. You are steps away from perfect Personalised Gifts for any occasion. It couldn’t be any easier… but if you do need some help we’ve also created a great video, just open the link on the right-hand side of the website called ‘How to place an order”. Don’t hesitate to create your own personalised artwork today.